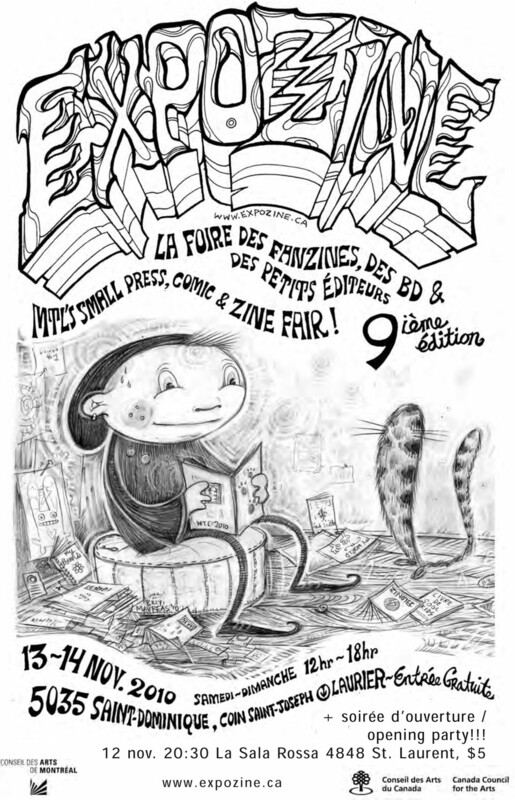 Expozine, Montreal’s annual small press, comic and zine fair, will take place on Saturday, November 13 and Sunday, November 14, 2010, from 12 p.m. to 6 p.m. at 5035 St-Dominique (Église Saint-Enfant Jésus, Laurier Métro). Free admission. Expozine OPENING PARTY, Friday, November 12, 8:30 p.m., Sala Rossa, 4848 St. Laurent, $5 FEATURING: Tony Ezzy and Super Fossil Power; readings by Sherwin Tjia and Mathieu Arsenault, and more! This incredible event brings together nearly 300 creators of all kinds of publications– from books to zines to graphic novels – in both English and French. In the past nine years, Expozine has become one of North America’s largest small press fairs, attracting thousands of visitors as well as exhibitors from across North America and even Europe! Special invited guests this year : the Fanzinothèque of France! Sunday 2 pm : Readings presented by Les Productions Arreuh with Marie-Paule Grimaldi and guests. Sunday 3 pm : Presentation: A look at art zines/ collaborative zines with Danielle St-Amour (Palimpsest Magazine) and Thanh Truc Trinh, Didier Lerebours (Pica Magazine). Come discover incredible publications and printed works that are hard to find anywhere, much less all in the same room! For more information, contact us by email at expozine@archivemontreal.org. Expozine is made possible through the support of the Canada Council for the Arts and the Conseil des Arts de Montréal.